NEW ORLEANS – May 22 is a day Andres “Chico” Gonzalez Jr., will never forget. That day, nine years ago, he was a young New Orleans police officer on duty with his partner, and they made what people who don’t wear a badge call a “routine” traffic stop. “We don’t use the word ‘routine,'” Gonzalez noted. Just 18 months on the job, he asked the driver to step out of the car, and the passenger, Eddie Harrison, bolted from the other side and took off down the street. Gonzalez, who had run cross-country at his Catholic high school, Archbishop Rummel in Metairie, chased him. He caught up to the suspect, who shot him. One of the bullets left the police officer paralyzed — and changed his life. On May 22 of this year, Gonzalez and his bride, Amanda Klein, “reclaimed the day” when they were married at Our Lady of Guadalupe Church in New Orleans. “It’s the happiest day of my life,” Amanda said afterward. On May 22, 2006, after Gonzalez took off on foot chasing Harrison through a New Orleans neighborhood, Harrison pulled a .40-caliber handgun out of his waistband and squeezed off two shots. The first bullet hit Gonzalez in the arm, and the second, at point-blank range, entered near his chin and severed his C-5 cervical vertebra. “I couldn’t figure out why I was on the ground and couldn’t move,” Gonzalez told the Clarion Herald, newspaper of the Archdiocese of New Orleans. As he lay paralyzed on the searing concrete, all Gonzalez remembers is Harrison standing over him. Gonzalez never lost consciousness. The paramedics arrived a few minutes later to save his life by getting him to the temporary emergency room. Harrison, who was captured two hours later, was convicted and is serving a life sentence at Angola. After surviving the initial surgery, Gonzalez went on to rehabilitation, where he tried to make sense of his new reality. 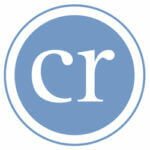 His rehab roommate, who was more severely paralyzed, helped rouse him from any self-pity. For a few years after the shooting, Gonzalez would drink five shots of alcohol — “one for every shot I took,” on the day’s anniversary. From his wheelchair, Gonzalez thought about ways he could repay those who had helped him in his recovery. In 2011, he launched a nonprofit called Help4Heroes.org that raises funds for first responders injured or killed in the line of duty. In planning one of the organization’s fundraisers, he met Amanda Klein, a paramedic who belongs to another nonprofit group called the Modified Dolls, women with tattoos or body piercings who band together to do community service projects that raise money for other nonprofits. Since she was a paramedic, Klein thought it would be great for the Dolls to support first responders, and a friend told her she had to call Gonzalez. The two met to talk business and over the course of the year fell in love, and the rest is history. 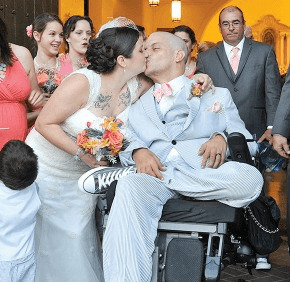 On their wedding day, Gonzalez rolled his wheelchair into position at the head of the main aisle at Our Lady of Guadalupe and greeted his bride as she was given away by her father. They exchanged smiles and then they exchanged vows. And then they exchanged rings. Andres moved his arm into position to place the ring on Amanda’s left hand. When it was her turn, Amanda took Chico’s left hand and did the same. At the end of the Mass, the beaming Gonzalez couple proceeded hand-in-hand down the aisle.